I should've known, when I woke up the day before our long-planned, Memorial Day Weekend/Daddy's birthday holiday in Santa Barbara, and discovered I'd come down with pink eye, that the weekend wasn't going to go exactly as planned. Foolishly, I maintained my optimism. After a quick trip to the eye doctor, and the pharmacy (not quick -- is it ever?) to get some drops, I was still looking forward to a long, relaxing trip: quality family time, sunshine and yummy meals and a fluffy king-sized hotel bed. But it was a long haul getting out the door the next morning. The kids were whiny. Daddy had to finish packing. Loading the car seemed to take forever. At the last minute, Daddy remembered the cat needed his medicine. The kids demanded bagels before we could get underway. And the skies were gray. The car ride itself was uneventful, save occasional pockets of traffic. But we still didn't manage to hit downtown Santa Barbara until nearly noon. The kids were ancy after nearly two hours strapped to car seats. We stumbled out of the car onto a castle-themed playground I'd found on the web, Kid's World in Alameda Park. It was cold and threatening rain. But somehow that didn't dampen anybody's spirits, and after we'd zipped up our jackets, the kids ran happily amok. The problem was, it was nearly lunchtime when we got there. And with three-year-olds, if you delay lunch, you do so at your peril. For a delayed lunch means a delayed nap ... and the onset of crankiness that can ruin the rest of the day. After an hour at the playground, the kids were far from done. But it was well past their regular lunchtime. So we forced the issue, promising to return to the park later in the weekend. Then it was back in the car (after potty and some more negotiating) and over to a lunch restaurant where the food was beautifully displayed -- and way too accessible for little hands. The kids were grabby and insistent and impatient, and not at all ready to behave in what was clearly an adult foodie hangout. Daddy had the impossible job of wrangling them and stuffing their mouths with yogurt while Mommy waited in line to pay for what they were already consuming. The kids didn't understand why, after I'd paid, they couldn't just help themselves to more of that on-display food. They had to be bribed with the promise of a cookie in the car so we could get them out of the place without further ruining everybody else's lunch. Then it was on to the hotel to check in. By now, we were perilously past the onset of naptime, and about to miss our window, beyond which overtiredness sets in, and getting the kids to sleep becomes impossible. Sure enough, the novelty of the pull-out couch bed, and the fun of putting their brand new sleeping bags atop it, kept them giggling and hyper and bouncing off the walls. By this time, Late Blooming Mom's pink eye had progressed to pink eye with a full-blown cold -- runny nose and all -- and Daddy's patience was, well, well nigh exhausted. Mommy had to lie down and begged for a half-hour's peace. Daddy, realizing the kids were simply not going to settle down, grumpily took them on a walk around the hotel grounds. When they returned, Daddy had gone from grumpy to furious. Mommy got up and coaxed the kids into actually laying down on the bed and being quiet. Then, at last -- at nearly five o'clock -- they fell asleep. Which naturally meant dinner would be delayed (so much for our six-fifteen reservation), and the kids wouldn't get a long enough nap. We had to wake them to go out to eat, after pushing our reservation later, and only got them into the car after howls of protest and kicking, screaming fits. Still I clung to the hope that, once pacified with pizza, the children would behave. Thing 1 insisted on sitting on Daddy's lap the entire time Daddy was trying to eat, as well as interrupting the meal frequently to be taken to the window to watch the man making the pizza. Thing 2 was briefly entertained by a new Color Wonder book and markers, but soon proved as restless as her brother. The fun kicked into high gear when the pizza maker took a shine to Thing 2 and gave her a little ball of pizza dough ... which she promptly refused to share with Thing 1. After attempting to reason with her (my big mistake -- you can't reason with a sleep-deprived three-year-old who has been hyped up on pizza and stimulated by a total break with her usual routine), I finally resorted to taking away said pizza dough. The resulting howls caused every adult in the entire restaurant to glare at us, and pass summary judgment on our parenting skills. 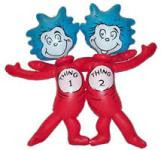 Thing 2 was carried, screaming, all the way to the car, and Thing 1 followed in full-blown whining mode. Getting them to bed was no easier. Both were told they were ruining Daddy's birthday (tomorrow), and threatened with the prospect of being packing up and driven home first thing in the morning. The threats didn't work. Neither did the yelling that followed the unheeded threats. Daddy finally lost it and left the room. At long last -- maybe at 11 pm or so -- they finally succumbed to actual sleep. Being able to shut the door and crawl into the king-sized (but too soft) bed was little consolation. Late Blooming Mom and about-to-turn-a-year-older Dad were in a state of extreme grumpiness. We didn't want to be with them, and we didn't want to be with each other. Daddy's birthday dawned cold and gray again -- not exactly typical Santa Barbara weather. The bathing suits we brought, and the blow-up pool toys, sat unused -- and would remain so for the entire trip, despite our going to the trouble of paying for a hotel with a pool. The kids were irritable and fussy over breakfast. Thing 2 refused to have her hair brushed. Thing 1 refused to leave the room. By the time we dragged them to the famous annual street-painting festival (I MADDONARI) in front of the Mission, they were only mildly tolerable. Thing 2 perked up considerably at the prospect of getting chalk and being allowed to decorate a square in the kids' area. But Thing 1 continued to be a pill, demanding his own square and chalk, then refusing to do anything with them except break the chalk. Finally, promised a ride on the carousel, they lightened up and we managed to get them into the car. At the carousel, they relaxed: this was an environment they could understand. Though Thing 1 nearly managed to come unglued because he wanted to ride the horse Thing 2 had already chosen, once the ride got underway, the morning was salvaged. Lunch at a beachside cafe was a little trying -- there was fighting over the Color Wonder markers, and Thing 1 insisted he didn't want the guacamole even as he shoved chips laden with it into his mouth. There were repeated, lengthy trips to the bathroom: now that they're out of diapers (except for nighttime), every restaurant bathroom is an amusement park. But after the meal, the kids got to play in the sand, and mommy and daddy got to collapse, weary and nearly out of juice, and just watch them. That day, though it involved more coaxing and threats, they napped a little earlier. They still got up to miss our five-thirty reservation at our favorite Santa Barbara restaurant. Getting them into the car to go there was another horrid chore, and we had to promise a trip to the bookstore (and prospect of buying new books) to pull it off. But as we waited on the line to get into the restaurant, salvation arrived in the form of the blues guitarist and drummer who set up shop outside to entertain us. And the free buttermilk fried chicken pieces the restaurant distributed to us, on cute plastic sword skewers, helped too. Dinner was a bit frantic, not the leisurely affair we'd enjoyed many times before in our pre-children days here. The kids tore through the basket of mini muffins on the table, but rejected nearly all of them after biting into them and then putting them back in the basket. But the food came fast (perhaps they took pity on us). We had to order the dark chocolate bread pudding souffle to go -- concealed in a bag -- so the kids wouldn't see it and demand sweets before bedtime. Back at the hotel, bedtime at the hotel was yet another interminable struggle. By the time they nodded off, Mommy and Daddy were again too grumpy to do much besides turn out the light and hope tomorrow might be better. The dark chocolate bread pudding souffle sat uneaten in the hotel fridge. Miraculously, that morning was okay. The kids were their picky selves at moments during breakfast, but being allowed to watch some TV seemed to pacify them, and after we'd checked out, we found ourselves in real sunshine, for the first time on the trip. Too late to save our hopes for swimming, the sun at least made a long enough appearance to make for a pleasant morning at a beachside playground. We'd stopped first at a bakery/restaurant to get some sandwiches for a picnic, and treat the kids to a morning snack of fresh baked goods. So they were well-fueled for playing, and we knew we wouldn't have to tear them away from the playground to go to a restaurant since we'd gotten the sandwiches. Free to climb and run and jump and get wet (the playground had a water feature), the kids were, well,PERFECT ANGELS. Just in time for us to pile in the car and go home. Thing 1 misbehaved at preschool. Apparently, while on the potty, he dropped the f-bomb. We know this because one of his teachers pulled Daddy aside at drop-off to let us know, and to request that maybe we teach him to say something inoffensive like "fudge." She added that she, too, has uttered the same word in front of her own kid while she burned herself on the stove, prompting her son to repeat it. Clearly she attempted to make us feel better by including this anecdote about herself. But suddenly all those times Late Blooming Mom or Daddy have uttered bad words in front of our kids are coming back to haunt us. And we can't help but feel like bad parents, wondering what the teacher and everyone else within earshot and above toddler age thinks of us. I knew my kids had learned "Goddammit!" from my own lips, utttered in exhaustion and exasperation. But I've already tried to persuade them to substitute the silly "Goshdarnit!" Thing 2 asked me what it means and I told her, "It means 'oh bother,' just like in WINNIE THE POOH." Since she's already fond of "oh bother," this was the perfect explanation, and she has, indeed, been happily using the new compound word I created to replace the swear word. But the f-bomb, I honestly can't recall saying in front of them. Daddy thinks he may have been to blame. I certainly could have. It's not that I don't watch my language around the kids 95% of the time. But goshdarnit, sometimes the lack of sleep and stress over trying to balance work and family life make me much less patient, and much more apt to explode in a string of epithets. Often the bad words are prompted by bad behavior on the kids' part -- refusing to listen, say, when asked to stop jumping off their beds onto the floor; refusing to go to bed; refusing to stop saying ... well, bad words. I'm embarrassed about my son saying the f-bomb. But what's worse is, when I try to point out to him that this isn't a nice word, and I suggest using another, he just laughs and keeps repeating it. If only he'd misheard, the way he did with "damn it," which accounts for him heartily proclaiming "Bam it!" several times a day, just for the thrill of it. I can't help but find it ironic, though, that Thing 1's potty mouth incident occurred WHILE he was using the potty. I gotta give the kid some credit. If you can't drop an f-bomb into your speech while sitting on the toilet, then when CAN you use the f---ing word? To anyone who claims they've never said a bad word in front of their kids -- who must've learned such things somewhere, I say -- what the hell. We're not going there for saying those words, and neither are our kids. But I realize I may be getting more than my share of notes from teachers in the year ahead. Bam it. It's Mother's Day: Call Your Mom. I Sure Wish I Could Call Mine. Those words aren't mine -- believe it or not, they were uttered by football coach Bear Bryant (New York Times columnist Thomas Friedman tells the story of how Bear came to say them in this Sunday's edition). But I heartily echo the sentiment. My mom's been physically gone from the world since November of 1992. But among all the cliches about loss, I've found this one particularly true: there isn't a day that goes by when I don't think about her. Friday I went to the kids' preschool for a special mother's day shabbat, and they presented me with the gifts -- wooden jewelry boxes they'd decorated, and mother's day cards made with their teachers' help. But what really touched me was that I was there with all these other moms, that I had finally joined this amazing sorority and that I had something deep and profound in common with them all: the experience of motherhood. I wish I could share it with my own mom, but at least I've joined the sisterhood, and it's given me an appreciation for all she did for me -- from making those cream cheese and radish sandwiches I took to school for lunch to schlepping me through Lord and Taylor's and Bloomie's and Macy's every year for clothes while putting up with my refusal to try on anything that wasn't Tomboy-ish, to sitting with me at the Macy's lunch counter after, and teaching me about the small pleasures of a sandwich and a milkshake. My mom was opinionated, brash, pushy, even intrusive at times. But she was witty, provocative, a great party-giver and a party guest unafraid to get a little drunk and pretend she was the bouncer (she once demanded an incoming party guest say who he was, even though he was the former Governor of NY; when he said his name, she said, "Oh, right, I voted for you," and let him pass). She was a voracious reader with an insatiable intellect. And though she could be hypercritical and harsh, when she caressed my cheek with her hand or hugged me tight, I felt safe and enveloped in warmth and a bottomless font of mother love. Now I know a little about just how much you have to put up with when you're a mom. And also about how indescribably blissful it is to see your children smile and hear them bust up laughing. The other week I burned myself cooking. Since then, my daughter has made a point, every day, of kissing me "on the burn" to make it better. My mom may be gone, but my daughter has found a way -- without knowing -- to make my hurt from that loss just a wee bit better. And the best part is, that part of her that wants to make me better is a part I recognize: it was part of my mom. Years before I became a mom, my mom taught me how to be one. Maybe I'm starting to teach my daughter. It's not just Daffy Duck who has "pronoun trouble." My three-year-olds sometimes say things so wrong, yet so adorable, that I hesitate to correct them. My son refers to his sister as "he." He says "Monica Book" instead of "Chanukah Book." He mispronounces new words in such cute ways I can't stand to correct them. My daughter confuses tenses constantly. Both kids say, "I carry you" when they want ME to carry THEM. It reminds me of that old Steve Martin routine, the one in which he admonishes the audience to say the wrong things in front of kids just for the fun of messing them up. They're also incessantly curious. When I say "It's raining," they ask, "Why?" They want to know where every new thing was purchased. Thing 1's constant refrain is, "Where you bought this?" Often followed by, "Who bought this?" My daughter is already delighting in language play, especially adding the words "poopy" or "underwear" to her favorite songs, then dissolving into incontrollable giggles. "Do Re Mi" from the SOUND OF MUSIC is her latest victim, but pretty much any phrase can be made into a great joke by the addition or substitution of "poopy." "Pee pee" is also popular. Since my husband is the household connoisseur of bathroom humor, he's especially pleased. I'm already missing the early days when they mangled words like "popsicle," when a banana was a "nana," and a strawberry was a "strawbear." I kick myself I haven't made more digital voice recordings because I know they'll be outgrowing their delightful inability to speak correctly. Of course, they've already learned a few words I wish they hadn't, mostly from overhearing me when I get exasperated. I've been campaigning to replace the "Goddammit!" they heard me utter, and insisted on repeating, with the much more harmless-sounding "Goshdarnit." But it's a losing battle. I'm no expert on early language acquisition, but I have learned this: toddler English is irresistibly cute. TWINKLE, TWINKLE LITTLE STAR. HOW I WONDER WHAT YOU ...UNDERWEAR!!!!! I wish I could laugh that easily. It's nice to be reminded that I probably once did. It's not because I need dental work. It's because I have two three-year-olds who won't go to bed. It matters not to them that they are overtired, exhausted, and one of them is sick. They just want to prolong their time awake, at whatever the cost to Late Blooming Mom's (and Dad's) sanity. It's not fear of the dark that's keeping them up (they have a night light). It's not fear of abandonment. They know damn well we are in the next room if they need us. It's all about control -- them, over us. It's at the point where one or the other parent has to stay in the room, laying between the cribs to make sure they keep quiet and stay in bed. This only exasperates me or my husband, and leads to us having precious little time for each other, or to ourselves, after bedtime. We've pulled out the threats -- no TV the next day, none at all -- and we've made good on the threats twice already. They're good for a night, then fall right back into their bad habits the next night. No wonder my teeth hurt. As I wrote in this space once before, as I child, I fought bedtime so hard that my own mom put me out in the hallway of our New York City apartment building with my blanket and my stuffed rabbit. I've been determined to avoid inflicting such trauma on my own kids; I know it was traumatic because forty-plus years later, I can still remember it. But I can sure as hell see where she was coming from. We have a bedtime routine. We limit the number of books we read. We cuddle to the same three songs on the same CD after books. Then we walk them to their beds, and put on the CD they associate with sleeping that they've heard practically since birth. Some nights, they make me insane. Tonight is one of those nights. So to all those other parents out there who may, this very night, be gritting their hurting teeth and wanting to slam doors and scream and tear out their last non-gray hairs, I say, I hear you, brothers and sisters. Wanna meet for a drink? Thing 1 has been suffering: fever, and a cough so hard it can make him throw up. Poor little guy did so in the middle of his nap yesterday, so I had to give him a bath. Then he did so again at 5 a.m. this morning. These past few nights he's been up at one or two, then again before sunrise. There's been a trip to the doctor, the introduction of new medicine -- with a mask, nebulizer and chamber to breathe into -- and lots of generally icky feeling moments. No matter how hard a slog it is to get through the nights -- and it's a slog for sure -- I just wanna wrap him up in love and make it all better. It breaks my heart that I can't. I wonder how many nights I had like this when I was a kid, and my heart goes out to my late parents, who surely had to deal with some of the same. This is how parenthood can soften you, in a good way. But I'm amazed at my own tenderness, given that just a few days ago, Thing 1 was being impossible. His terrible-threes seem to have been peaking of late, fits aplenty, with kicking and whining and a million surly "I don't want to's". As a result, I've been furious at him. Furious to a point of fury that you can get to only with someone you love. I simply can't get over how my feelings can go from teeth-gritting anger to heart-melting tenderness toward the same small, 30-plus-pound being. Yesterday when I walked into his room and found him covered in throw-up, he gave me the saddest look, and then said, simply, "You take care of me." At moments like that, I know what I'm here for. Later, I dried his hair and carried him back to his room from the bathtub, snug in a towel, all wrapped up like a human cannoli. He still asks me to carry him using the wrong pronoun. He says, "I carry you" when he wants me to carry him. But in some ways, he's right. By allowing me to love him, he's carrying me. I just hope the lil' guy feels better soon.